The Sheepwagon is a unique display of western history. In the late 1800’s these distinctive camps were seen often in Wyoming, Colorado, Idaho, Montana and several other western states. The sheep herder would pull his wagon along and follow the grazing sheep. Living in the camp year round, this would be the only home a herder had. The historic design has proven efficient for well over a hundred years. 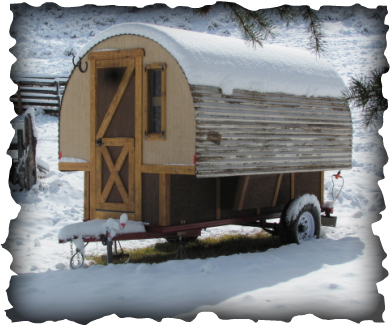 Times have changed, even though you can still find a sheep herder living in his sheepwagon following his herd of sheep, most of the sheepwagons I sell today are used as a guest house or portable living quarters on a piece of recreational property. My camps are built with today’s up to date fasteners and building materials. These camps are built to last much longer then yesterdays predecessor. The layout, design and size are very close to the original blueprint. My camps are extremely well insulated; they stay cooler in the summer and warmer in the winter. These camps are very easy to heat, instead of the traditional wood burning fire place I’m using a much safer electric or propane heat source. · Weight is approximately 1,700 lbs. Please contact Hoss Port at 303-503-3876 or email mailto:hoss.port@icloud.com for more info.